Before we visited we’d heard that Cuban food is not very exciting so we didn’t have high hopes. 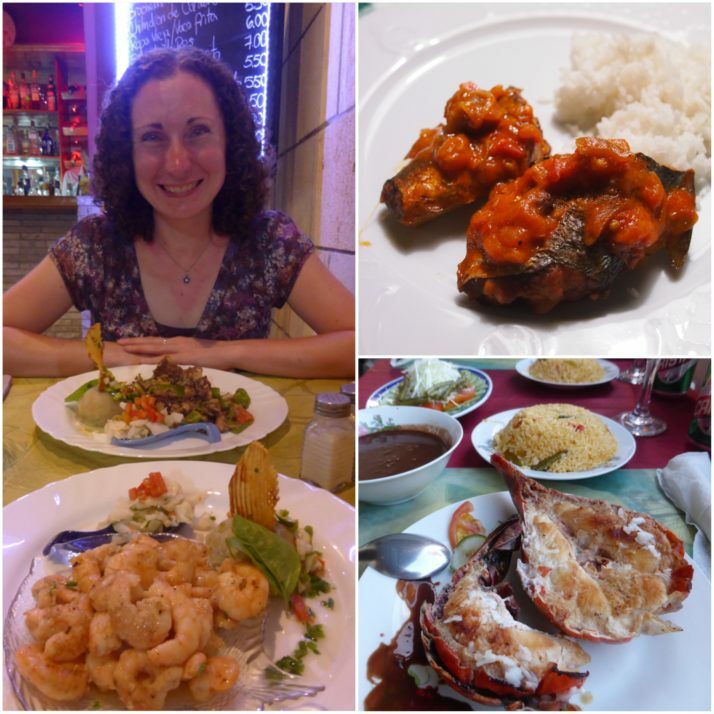 There were high points, mostly in the dinners that we had in our casa particulars, but for the most part we found the food to be fairly dull and certainly not a highlight of the trip as it has been in so many of the countries that we’ve visited. We were surprised that, compared to their neighbours (either the surrounding Caribbean islands or nearby Mexico), neither chillis nor other spices were commonly used. 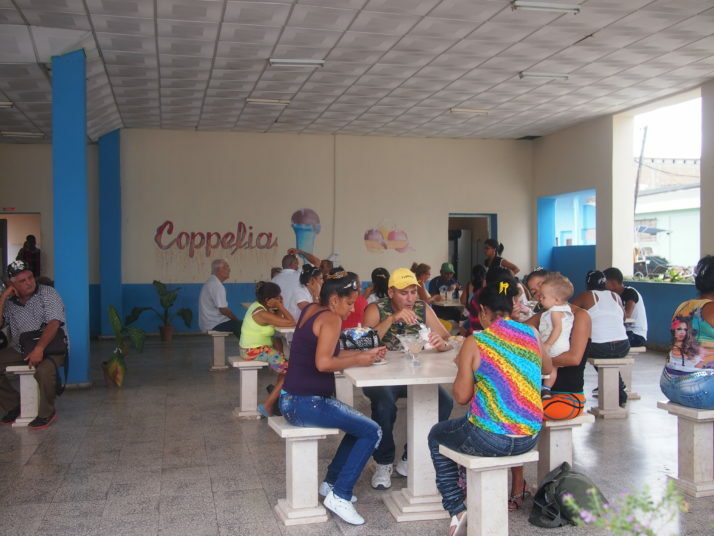 It is perhaps telling that the best meal we had (by a long way) was at a Spanish restaurant – Castropol on the Malecon in Havana which is run by the local Spanish Asturianas society. 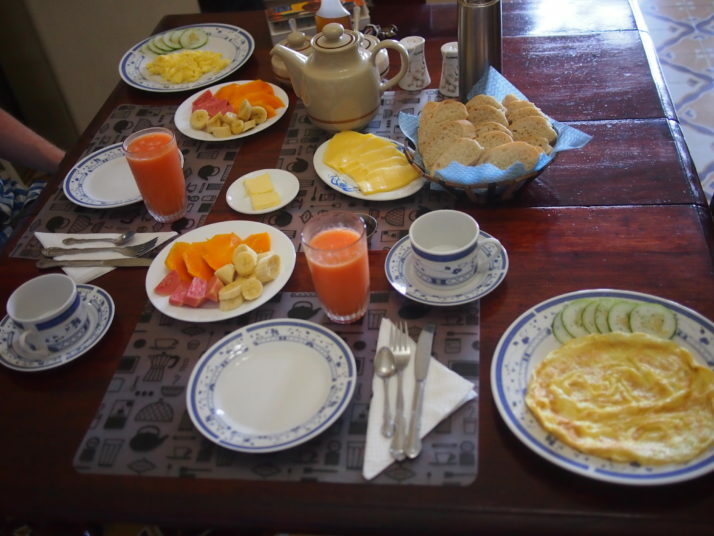 Breakfast in casa particulars is very standard and although priced separately to the room it seems to be expected that you’ll take it – fresh fruit (some combination of papaya, pineapple, guava or mango), freshly made juice (usually papaya or guava, on good days mango! ), coffee (filter, pretty strong, never instant and we were very rarely offered tea), eggs (fried, scrambled or omelette as you like), bread (always white, sometimes dried out and crispy), sometimes cheese or ham (both processed) to go with the bread, or as a sandwich. It was tasty enough but got to be pretty boring by the end of 6 weeks! 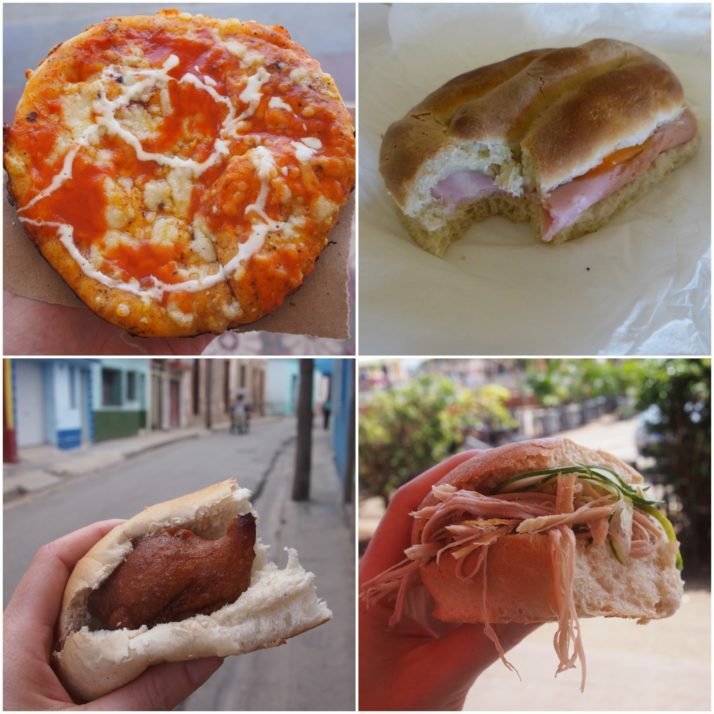 It’s fairly easy to find a bite to eat when you’re wandering the streets in Cuban cities. Pizza shops are everywhere and, while it’s not what an Italian would recognise, the pizzas are served hot from the oven, the puffy dough topped with a slick of tomato paste and a sparse sprinkling of cheese, handed to you folded in half with a small piece of cardboard or paper to protect your fingers (asbestos hands required!). They became our go-to lunchtime filler, not so healthy, but Andrew would have had at least one a day if I’d have let him… At MN$5-10 each (about £0.15-0.30) Cuban pizzas are delicious and cheap. 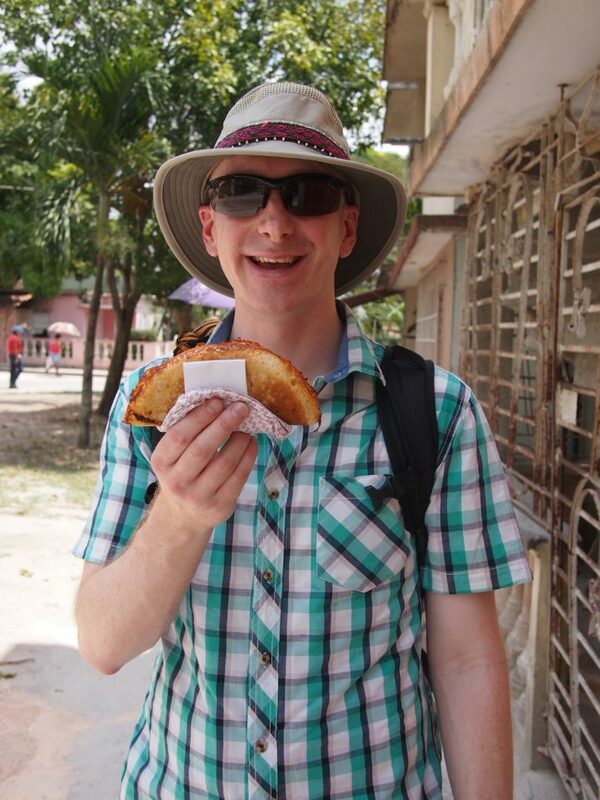 Andrew looking very happy with his first Cuban pizza even though he had to deploy his handkerchief to protect his fingers from the steaming dough! As an alternative to pizza, sandwiches are the other lunchtime option, also sold from little hole-in-the-wall shops. The bread is always soft and white with highly processed ham and/or cheese to fill it (interestingly cheese was often more expensive than ham). Sometimes we had bread with mayonnaise (i.e. a mayo sandwich, better than it sounds), or bread with tomatoes (the best option if it’s available), and occasionally fritters of savoury dough or mashed potato. If we were very lucky we found a stall selling pan con lechon, roast pork sandwiches. Chicken and pork were the most common options, usually just fried with some garlic or onions, but the best meals we had were beef and lamb. Ropa vieja literally means ‘old clothes’ but it’s a lot tastier than that sounds, imagine pulled pork but made from beef in a sauce made from tomatoes and peppers. We were served lamb casserole a couple of times in different casa particulars and each time it was meltingly tender and deeply flavoured – why don’t they do something like this with all the chicken and pork?! 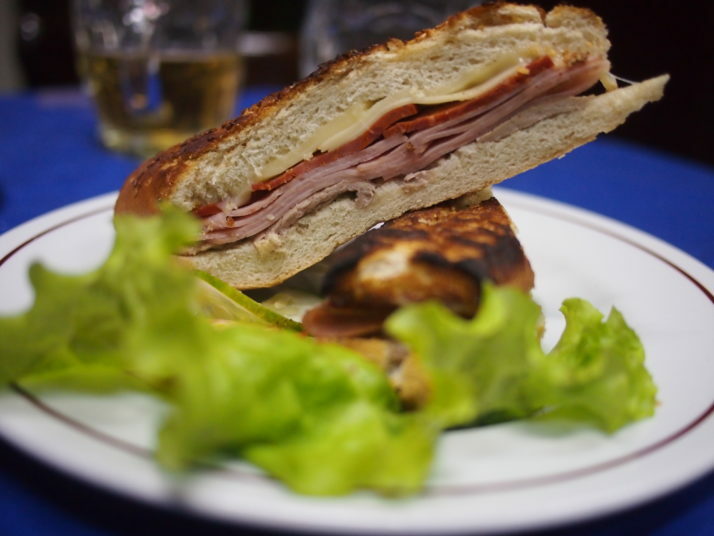 Cuba is a long, narrow island which means that you’re never far from the sea and so it’s hardly surprising that fish and seafood are readily available. We had various kinds of fish as well as prawns, lobster and even octopus. Again we found that they would most commonly be prepared quite simply by either frying or grilling perhaps with a little garlic or a tomato based sauce. 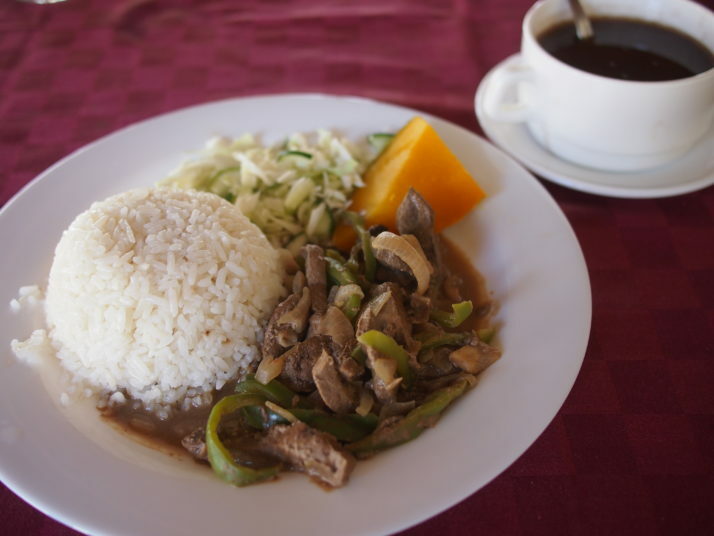 The standard starch with a meal is rice, either plain white or the rather politically incorrectly named ‘moros y cristianos’ (moors and christians), a mix of rice with black beans which was our favoured option. I really enjoy bean soups and I think they’re probably a staple of Cuban home cooking but we hardly ever saw them on restaurant menus – I suspect it’s considered poor people’s food. We did sometimes get bean soup as a starter for dinner in casa particulars and when I requested it for dinner from our casa in Camagüey she looked very pleased to be asked for it. The beans are usually either black or kidney beans and the soup might also contain bits of ham, peppers and pumpkin. 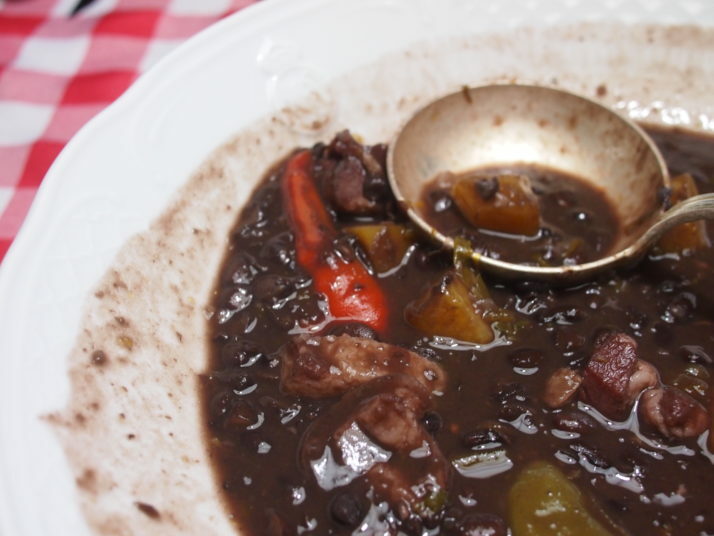 Black bean soup in Camagüey – delicious but not easy to photograph! 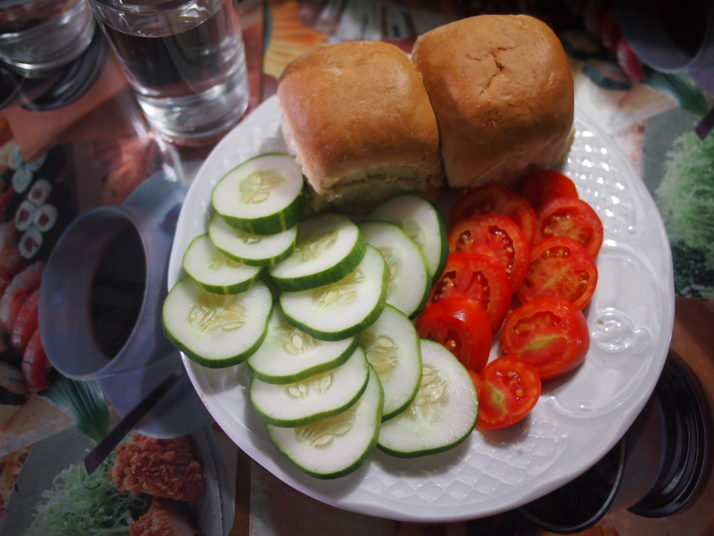 A salad of tomatoes, cucumbers and white cabbage was the customary accompaniment with dinner. If we were lucky it had some grated carrot, beetroot or cooked french beans on the side too. Otherwise the only vegetables that we were served, apart from a rare bowl of pumpkin soup, were plantains or green bananas. 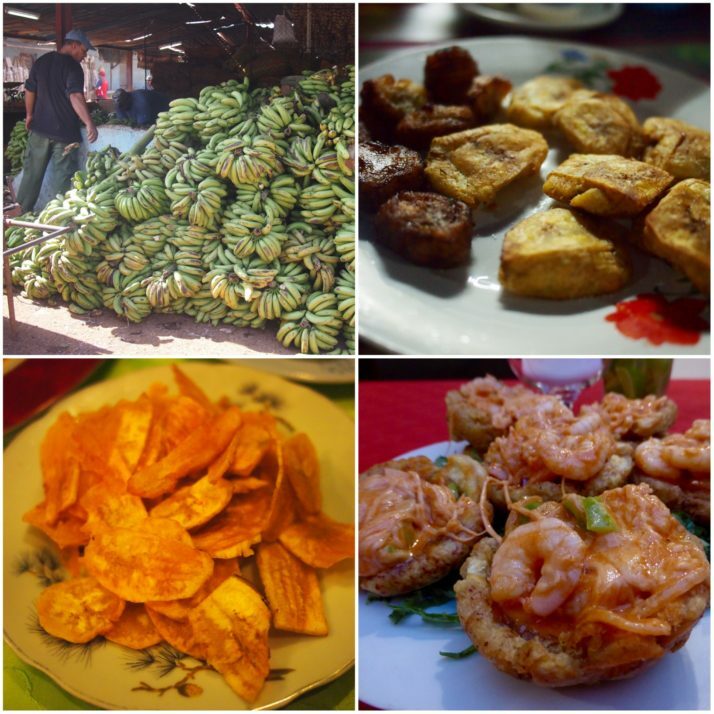 Plantains seem to fall somewhere between vegetables and starch in terms of how they are used in Cuba. Sometimes deep-fried until they are crispy (chicharritas), sometimes fried but soft in the middle, sometimes baked into a tart shell and filled with prawns or meat as a starter, they seemed to function a bit like potatoes. When we didn’t feel like pizza or a processed cheese sandwich for lunch we bought a handful of tomatoes and cucumbers and a loaf of bread. 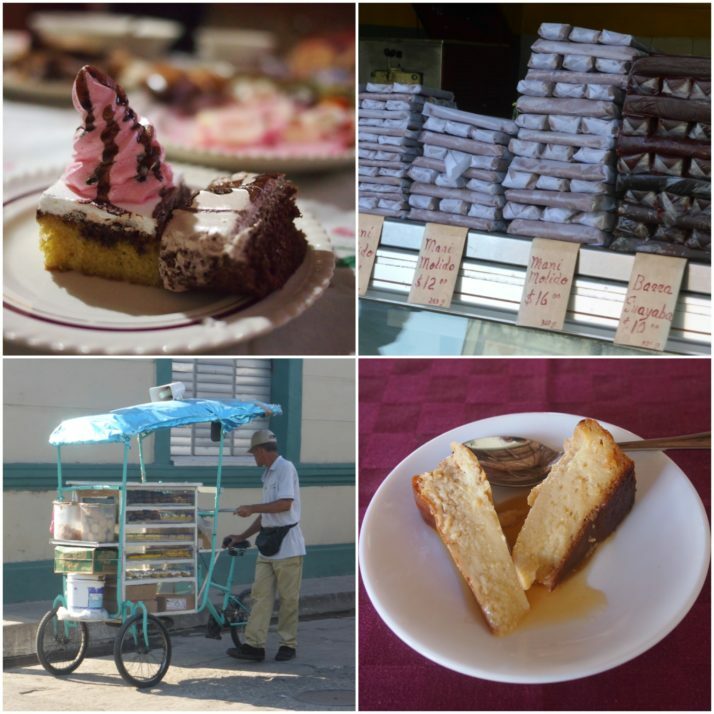 Satisfying your sweet tooth in Cuba is easy and cheap. 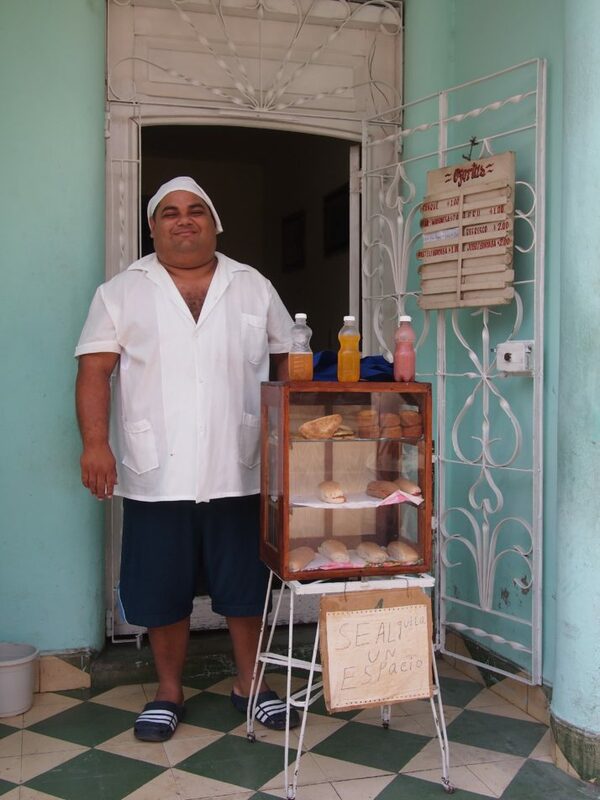 Cakes, biscuits and pastels (little pasties containing guava jam) are available from street vendors and hole-in-the-wall shops and generally cost MN$1-3 each (£0.03-0.09). The cakes are heavy on the icing which looks like swirls of cream but is actually marshmallow fluff! We found quite a lot of sweets made from nuts, as well as the coconut based cucuruchu in Baracoa, we saw bars of pounded peanut in several places and cones of caramelised peanuts were for sale in all of the main squares on an evening. In restaurants flan (Spanish creme caramel) is the most common option. 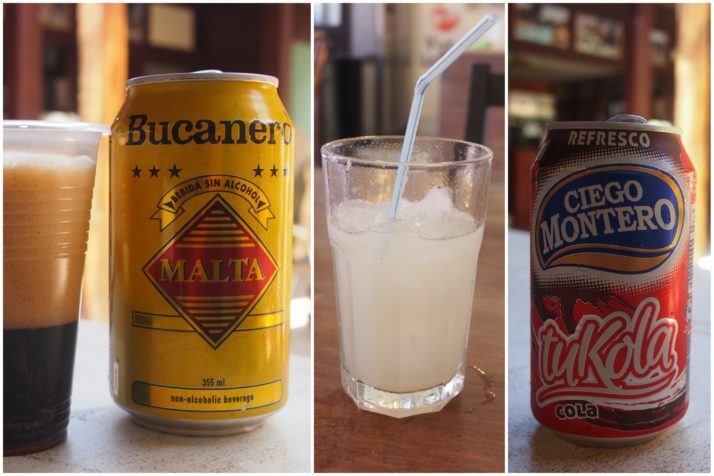 Soft drinks in Cuba fall into two categories: freshly made fruit juices or cans of Cuban made fizzy pop. Alongside the usual cola, lemonade and fizzy orange options is Malta, a malted soft drink which smells exactly like a Soreen malt loaf – too sweet for me but Andrew liked it. At peso food stands what looked like squash was served by the glass but as we weren’t sure about the water used to make it we never tried one. Coffee is also available at peso food stands and usually cost MN$1 (~£0.03) for an espresso size cup poured from a Thermos flask. Tea is practically unknown so if you’d struggle without it I would advise you to pack some teabags! 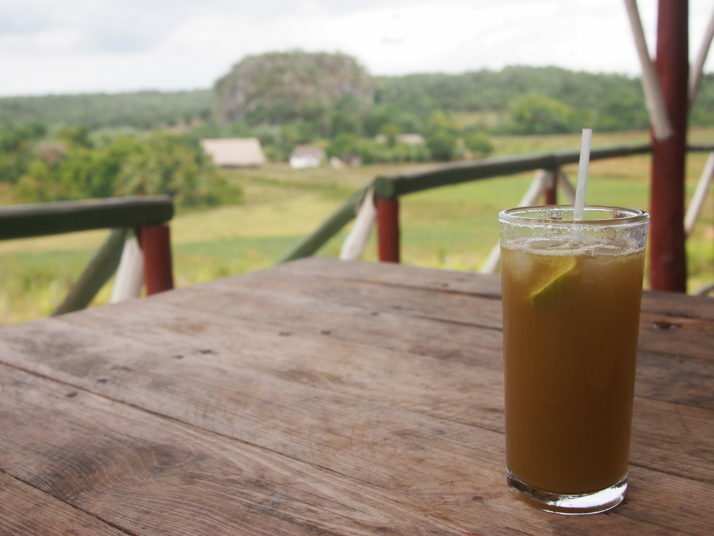 As sugar is a major crop in Cuba, it’s unsurprising that the most common alcohol is rum which is distilled from sugar cane juice. Rum based cocktails, e.g. 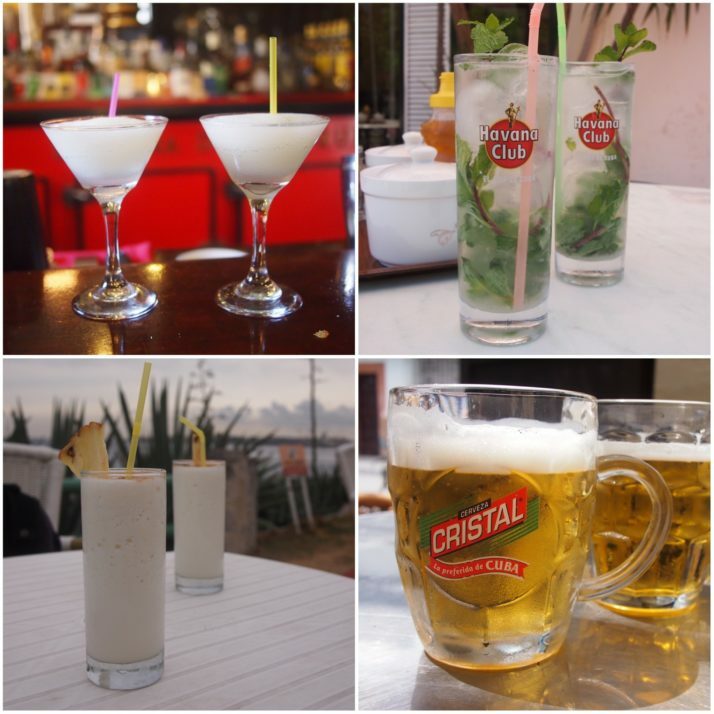 mojito, daiquiri, piña colada, were the order of the day if we weren’t sampling one of the various Cuban brands of lager-like beer. In Havana, there’s a micro brewery in Plaza Vieja in the heart of the old town. We tried one of their brews and really enjoyed it but sadly the service was so awful that we couldn’t bring ourselves to go back. 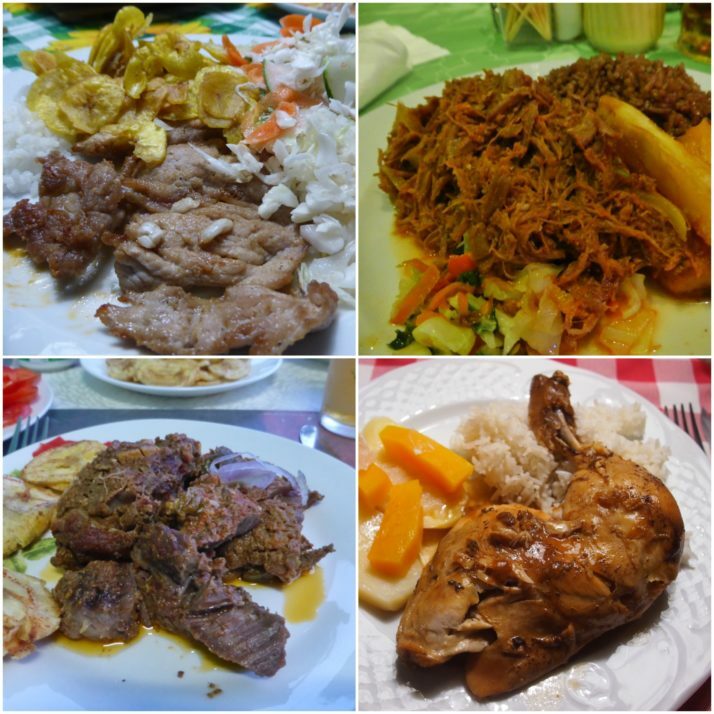 This entry was posted in Experiences and tagged Cuba, Food, Pizza on July 1, 2016 by Julie. Lovely photos and great descriptions. Enjoyed seeing and reading about the food and drinks almost as much as you obviously enjoyed the eating and drinking of (most) of them! As you say, strange that the food is not a little more flavoursome and varied, given Cuba’s near (and spicey), neighbours. Perhaps this may change as the island opens up to the rest of the world and outside influences. Funny that tomato and cucumber salad is the most common salad in Cuba given that on the other side of the world we avoided scurvy with practically the same thing in Uzbekistan! Weird they don’t use more spices. What is 11 + 19 ?